We have just released Version 2.8 of the exacqVision video surveillance software, for all exacqVision Hybrid and IP NVR systems. This latest release, compatible with all exacqVision systems, continues our quest to issue incremental releases (about every six weeks) in response to customer-requested features and enhancements. Version 2.8 can be downloaded here. Version 2.8 has significant enhancements for running multiple monitors on a client station. Perhaps the most significant is the ability to drag any video camera – either the video window or the camera name from the camera tree – into any other viewing pane of any other monitor. Creating video walls, or having specific functions in each monitor: viewing in one, search in another, event monitoring in another, the multi-monitor mode of the exacqVision client is very powerful. Press Control-Z in the exacqVision client, and use the mouse to draw a rectangle around any area of an image for instant zooming to that section of the image. Security – To further strengthen the security of their video products, Axis added support for HTTP Digest Authentication in most of their products. HTTP Digest Authentication is used for more secure authentication over both HTTP and RTSP. exacqVision Version 2.8 now supports Digest Authentication in Axis cameras. Enhanced PTZ Presets – Version 2.8 adds more robust PTZ preset modes for the Axis 212, 215 and 233D cameras. Vivotek – Added support for the entire line of 6000-series and 7000-series Vivotek IP cameras. IQinvision – Added support for the new Sentinel Series of all-weather outdoor POE IP cameras. Additional PTZ protocols for analog PTZ cameras for use on exacqVision Hybrid Servers have been added. 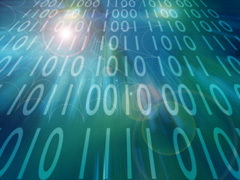 These new protocols include Bosch, GE-Impac, and GE-ASCII. We are getting closer to officially releasing the Linux version of exacqVision. For our current Linux Beta Testers, we have updated the exacqVision Linux release to Version 2.8 as well, and you can download that using the same download links we provided you initially. The first release of exacqVision Linux will be based on the Ubuntu 6.06 distribution, and will be identical in form and function in every way to our Windows version of exacqVision. Both client and server will be available in Linux versions across our product line. You can freely mix and match: Windows clients can be connected to Linux servers, and vice-versa. We anticipate releasing exacqVision Linux by the end of November, 2007. Going back further, we had IP Camera Finder in Version 2.3 (Feb 07), Multi-Monitor support in Version 2.2 (Jan 07), and many, many other enhancements and bug fixes. As always, the latest versions of exacqVision client and server software can easily and quickly be copied over existing versions while retaining all user settings. Version 2.8 of exacqVision is available on our Downloads page. 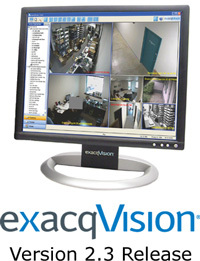 We have just released Version 2.7 of the exacqVision IP video surveillance software. This latest release, compatible with all exacqVision systems, continues our quest to issue incremental releases (about every six weeks) in response to customer-requested features and enhancements. Version 2.7 can be downloaded here. Version 2.7 adds a substantially increased secure level of watermark authentication on exported video using the industry standard, NIST-approved Hash Message Authentication Code, or HMAC. For any export of video, regardless of the number of cameras, types of cameras (analog or IP), or length of export, the entire export is authenticated with HMAC. This is a highly secure, accurate and defendable means of verifying the authenticity of any frame of any camera in the video export. The authentication would not pass if any frame of any camera had been modified, deleted or added. 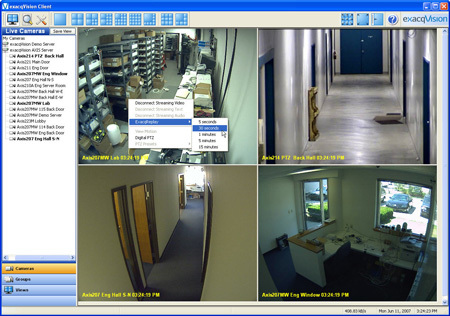 Arecont Vision – Added support for the Arecont panoramic cameras, models AV8180 and AV8360. Playback of video is now enhanced through unlimited acceleration forward of backward by pressing the FF or RW button. Go from 1x to 2x to 4x to 8x to 16x and on and on. Substantial improvements have been made to ePlayer, the program that accompanies exported video. ePlayer is included with all video exports and allows the viewer to play back exported video in the same way it was recorded without needing the exacqVision client or system. Status information – new options to enable display of camera names, time stamps, alarm mode, and more. Enhanced FF/RW – clicking on Fast Forward and Rewind buttons now allows unlimited speeds forward and backward, just like the new feature in the exacqVision client. HMAC Authentication – ePlayer allows the viewer to quickly verify that the video is authentic using the enhanced HMAC authentication added to exacqVision. As always, the latest versions of exacqVision client and server software can easily and quickly be copied over existing versions while retaining all user settings. Version 2.7 of exacqVision is available on our Downloads page. 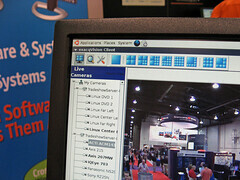 We’ve just released Version 2.6 of the exacqVision IP video surveillance software. This latest release continues our quest to issue incremental releases about every six weeks to continually add customer-requested features. Version 2.6 can be downloaded here. Shortcut Function key support – function keys for help, hide navigation panel, hide toolbar, and full screen. Weâ€™ve implemented one of the key usability features weâ€™ve wanted in exacqVision. 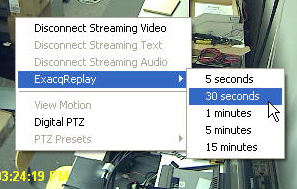 With exacqReplay, you can right-click on any live window window and see the last few seconds or few minutes of video recorded on that camera. That window can be resized and displayed in-line or on another monitor. The video selection can be “scrubbed” back and forth, and you can step thru the clip frame by frame, both forward and backward. You can also right-click to bring up a menu where you can save individual images, video clips, and even burn directly to a CD-R or DVD-RAM. Weâ€™ve added support for USB joysticks to control the PTZ functions within exacqVision client. Using a USB joystick, you can control not only specific PTZ cameras, analog or IP, but also control fixed camera PTZ using our Digital PTZ functionality. Any USB joystick will work, including gaming joysticks. However, we recommend the Axis 295 Professional USB Joystick. We will list additional professional-grade USB joysticks on our website soon. We now support the Arecont 5100 5 Mpixel IP camera. This unique high-resolution camera delivers spectacular images, at 15 fps, at a resolution of 2560×1600. We have improved the integration with many of the newer Axis IP cameras, adding support for unique frame rate, resolution and audio support. Version 2.6 of exacqVision is available on our Downloads page. As always, new versions of both client and server can be installed on top of previous versions while fully retaining all user settings. Version 2.5 of exacqVision software has been released, part of our continued commitment to rapid, incremental releases. Version 2.5 incorporates a number of new features and improvements, and is available for immediate download on the Exacq Downloads Page. Fixes for a number of minor issues, including issues with some ATI and Intel VGA devices; IP Camera Finder and IQeye cameras; error handling from SMTP servers; start and stop events from POS/ATM profiles; and more. A complete list of fixes is in the readme.txt file that accompanies the file download. The latest versions of exacqVision client and exacqVision server can be easily installed on top of existing versions while retaining all of the previous user-defined settings. One of the major things we’ll be showing at the ISC West conference in Las Vegas this week is our latest Version 2.4 release of the exacqVision IP video surveillance product line. exacqVision now supports the wide range of Arecont Vision megapixel cameras. Our complete list of supported cameras in 2.4 is here. Audio recording is now supported on all Axis cameras with audio input capabilities. Audio can be recorded by alarm event, by schedule, or free run. Support added for the “new protocol” Panasonic analog PTZ cameras, including the WV-CS954. Global time lapse mode, definable in minutes per image, for purposes of proper system operation verification on searches. Support added for pre-motion recording, definable in seconds. Enables a more fluid playback on motion-related events. Finer graphical granularity on alarm and motion flags on search page, and other usability enhancements. Groups can now contain audio and serial inputs in addition to video inputs. Selectable icons per group now available for easier visual distinction. More robust system log searches, with enhanced sorting, selecting, copying, and user feedback. As always, the latest versions of exacqVision client and server software can be easily installed on top of existing versions, with all user info, settings, and video remaining the same. If you’re coming to ISC West, come by and see us at Booth #6049. The show runs Wednesday – Friday, March 28-30, 2007. New IP Camera Support – ACTi and Panasonic IP cameras are now supported, joining Axis, IQeye, Sony and others. 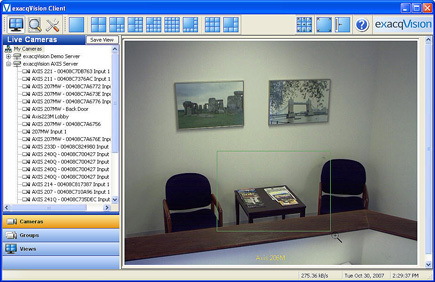 New IP Camera Finder – An automatic IP Camera Finder is now built into exacqVision. It will scan a network, report back on the cameras found, and automatically add the ones you select into the system. This makes adding IP cameras about as plug-and-play as you can get. And with exacqVision, there is no per-camera licensing issues, no camera MAC address entry required, no DLKs needed to make it work. 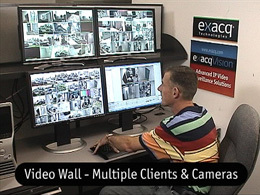 exacqVision makes working with IP cameras very easy. DST Patch – exacqVision Version 2.3 incorporates the necessary patch to correct for the new Daylight Savings Times that will occur in 2007. Search Enhancements – Significant tweaks in exacqVision Search for better performance and more intuitive interaction. Greater reliability for very large video exports, more interactive user feedback during video export process, and more. exacqVision Version 2.3 client and server can be installed easily and quickly on top of any existing version without affecting any settings or user parameters. Version 2.3 client, server, and User Manual are all available on our Downloads page.